Our plan when I married my wife was to have one or two children. Lifesong recently helped us add our eighth. From the bottom of our hearts, we are so grateful God allowed us to be part of His plan in this way and to be surrounded by our incredible children. It is amazing He was able to pull us through our own selfishness to the life we now live! God has orchestrated every step in our lives to lead to being a large adoptive family that will continue to grow, giving us abilities and circumstances to make it happen. After I unexpectedly lost my father at age 17, my wife’s parents virtually “adopted” me, taking me into their home and spiritual training. This was the first notion of adoption that entered into our lives. Later on, He brought us face-to-face with other adoptive families, catching and holding our attention to the plight of sweet children all over the world. What a precious time as we came to more fully understand how we are adopted into the family of God. We completed our first adoption from South Korea! Our little family of four grew to a family of five. We felt our hands were more than full with the addition of our third child, nicknamed the “Tiny Tornado.” My wife would joke with folks who asked if God was calling us to adopt again. She would say that if He did, He would have to make it crystal clear. “He would have to write us a letter!” she would say with a laugh. Mission trips to aid orphanages in El Salvador impacted us deeply and forever changed how we see every individual we meet, and suddenly we realized God had written us a letter! The Bible! 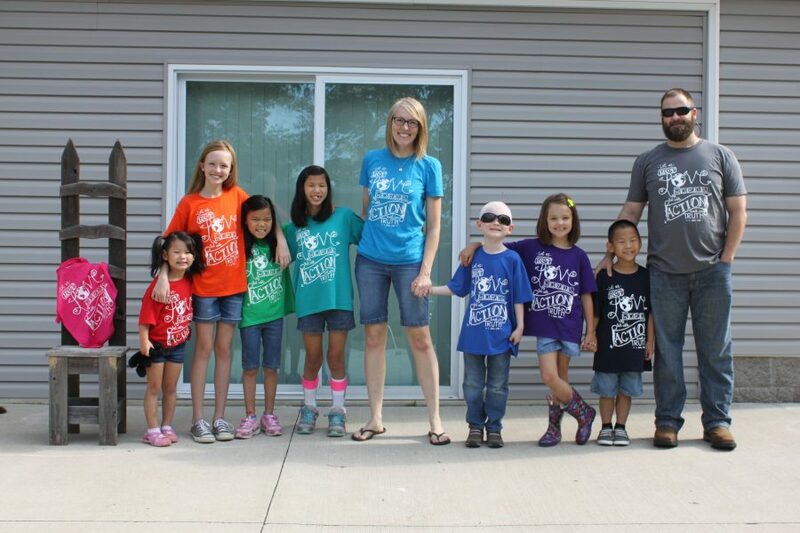 We began looking into China’s special needs program, and a year later, God brought home our 4th and 5th kiddos! … but God’s power overcomes our limitations! God opened our hearts to show us there was so much more we could do, and our 6th & 7th kiddos came home another year later in 2015, both at 9 years of age from China. One of our new daughters struggled immensely with the changes in her life. She rejected us and asked to go back to China. God softened her heart and completely changed her outlook in such a short amount of time, blessing our home with peace again. By this point, God had given us a confidence that this would not be our last adoption. Our sweet Hannah (number 8!) came home with the help of our Lifesong family and the incredible folks at the Chosen & Dearly Loved Foundation in 2016. She had more mobility needs than we had previously faced. It was exhausting, but God sustained us and continues to give us new-found energy! Our family is in “sync,” balancing our new normal and thriving. We tell people all the time that He performs miracles in our home every single day. Thank you, Jonathon and Christella, for sharing your story and for reminding us that adoption and all its many details are truly a work of God from the beginning. We are sorry for the loss of your father, but we are grateful for your Heavenly Father’s commitment to work it for good in your life and the lives of your EIGHT (and counting?) beautiful children.